Discover the world’s biggest mad championship race of super real racing bikers. Most intense moto Racing experience of all time. 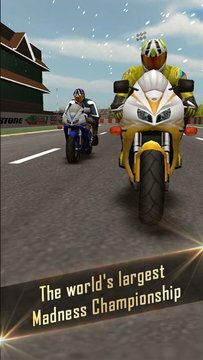 Pick the bike of your dream, switch lanes using easy swipe control with auto acceleration as well as auto braking features and enjoy the ultimate bike track race blast. 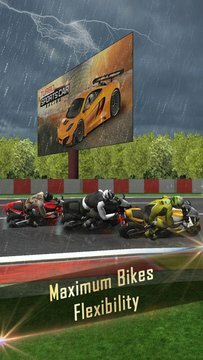 In Super-fast Sports Bike racing 3D, you’ll be amazed at the responsiveness of the turbo biker squad in this game. The more you play, the faster (and more addicted) you’ll get. Easy to start your racing career and improve your driving skills step by step and fulfill your fever and passion of turbo bike racing rally. Shift your gear and race in variety of racing tracks with a ton of weather conditions. Game play is very easy and addictive to play. Shift your Bike onto left or right lane by just swapping left or right. Avoid to collision with your racing rivals and furious accidents. Unlock the awesome racing bikes (available in game’s store) and challenge the extreme speed. Upgrade your bikes fuel tank and their life power in order to progress. - Collect different pickups to get extra items. - Complete level objectives and unlock super bikes.